This overnight shuttle hike shows you a lot of the Wilderness. Carry 6-7 liters of water and hike in spring or fall, when the highs are not predicted to go above 70˚ F. The sand can reflect back an amazing amount of heat in the direct sunlight. 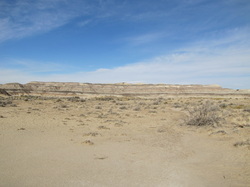 From the parking lot (N 36˚ 18.729'; W 108˚ 00.161'), walk north on the old jeep track (shown, left). Look back south and you will see quite clearly the mesa on which Pueblo Alto sits, in Chaco Canyon National History Park. 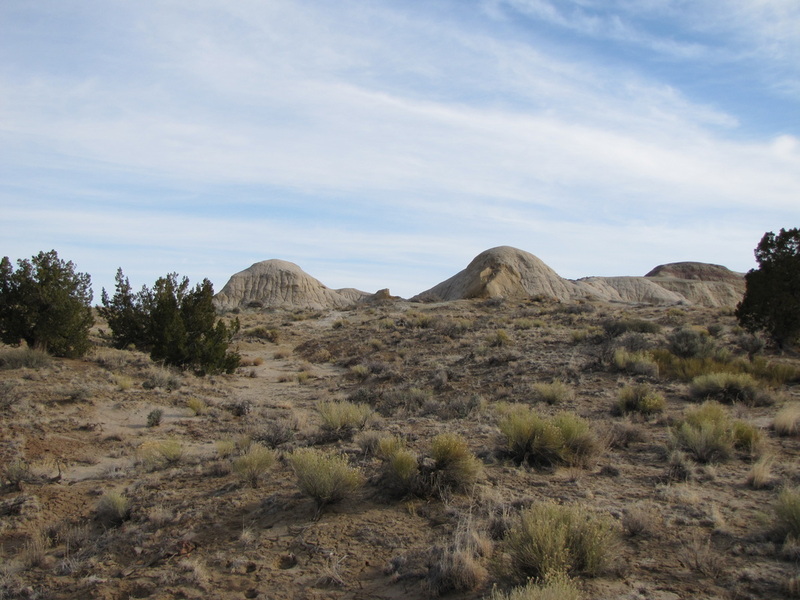 The plain you start from is called "Split Lip Flats" on the USGS topographical maps. 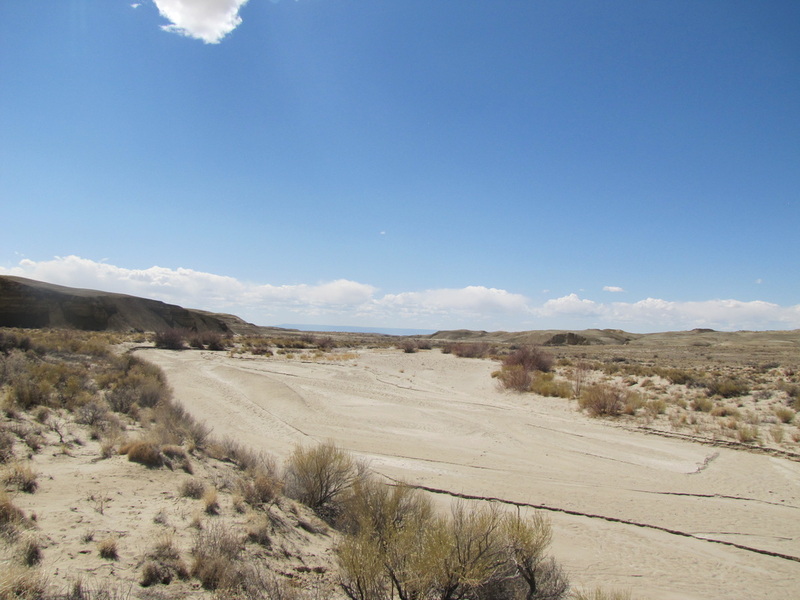 You will walk north on this track for a mile or so, as it dips and twists across washes. Someone has left a generous number of cairns along the way. The colors of tan and gray are significant at this point where the path dips down. 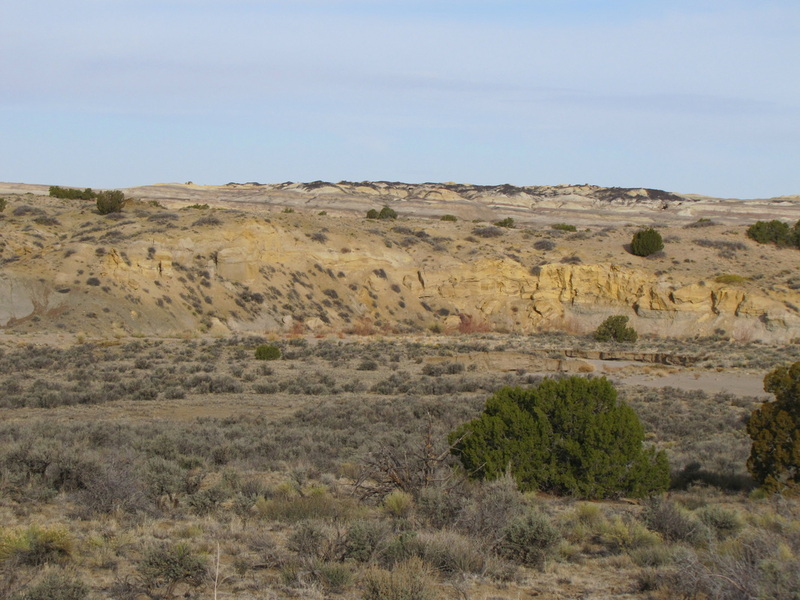 At this place in De-Na-Zin, where the tan Ojo Alamo meets the gray Kirtland Formation, is the K/T boundary, which divides the age of dinosaurs from the age of mammals. There is an "unconformity" between the layers, so the iridium-bearing relic of the ancient meteor is missing. 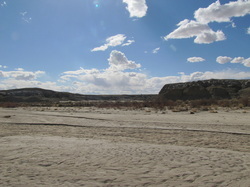 The change in color between Kirtland and Ojo Alamo is visible in the picture, below right. 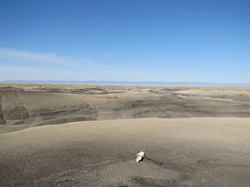 At its right edge, near the midpoint of the photo, you can see that the gray Kirtland stands above the wash with the tan Ojo Alamo layer on top. The path is easiest if you deviate east a little as you come out of the wash, toward these light gray mounds. At the top of the rise you can look down onto the limestone tubes (or whatever they are). These things look like impossibly large petrified trunks or, more likely, limestone tubes left over from old water channels that ran under the clay. I am not really sure which. The lichen that grows on them usually indicates petrified wood, and depends on organic matter for its survival. 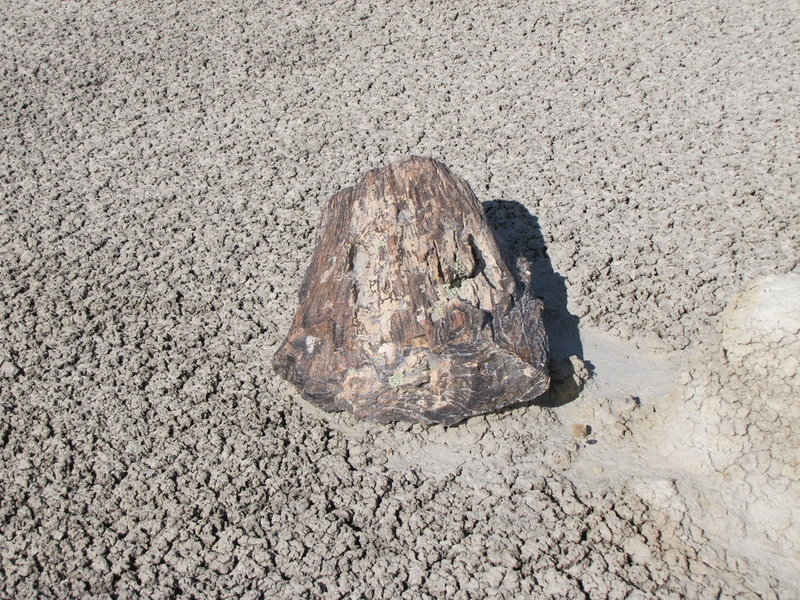 But the formation lacks any of the wood grain or knots that indicate petrified wood. Anyway, they are interesting to look at and probably you can tell what they are better than I can. Be aware of the cryptobiotic soil surrounding the formation. These are black grainy lumps about 3 inches in diameter that sit right on the surface and look vaguely like fungus. Such soil is easily damaged and should not be walked on. You will come to a broad flat place where the sediments have been washed every which way. I think that in a wetter climate, this would be a pond. 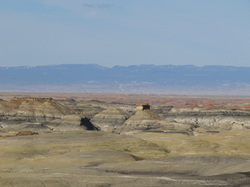 Looking north and west from this flats, a ridge runs, with many colors exposed. You can climb to the top of the ridge in any number of ways. It only looks imposing. The easiest ways up are on the north side - go east a couple hundred yards instead of climbing the ridge, and cross over a small rise to the north side of the same ridge. The ridge is a single line running east-west, surrounded by flats and easily walked around. The coolest weird stuff is on the east edge of the ridge-top. I suggest climbing it by heading northwesterly from the coordinates in the title of this section. 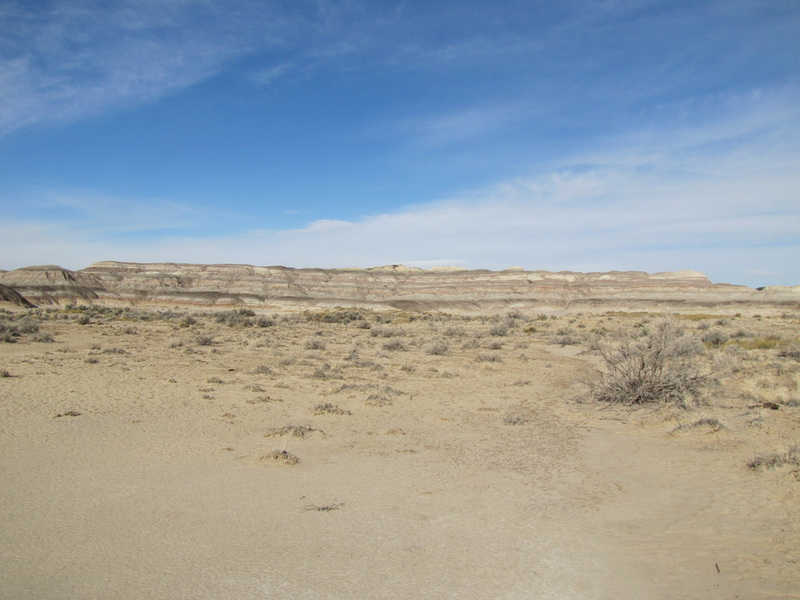 A third option is to skirt the south edge of the rise in the picture, going further west along its foot for a few hundred yards, to an animal track down off the mesa. The track is visible in the dark gray ash at the foot of the southern edge of the ridge (coordinates next time, I promise). 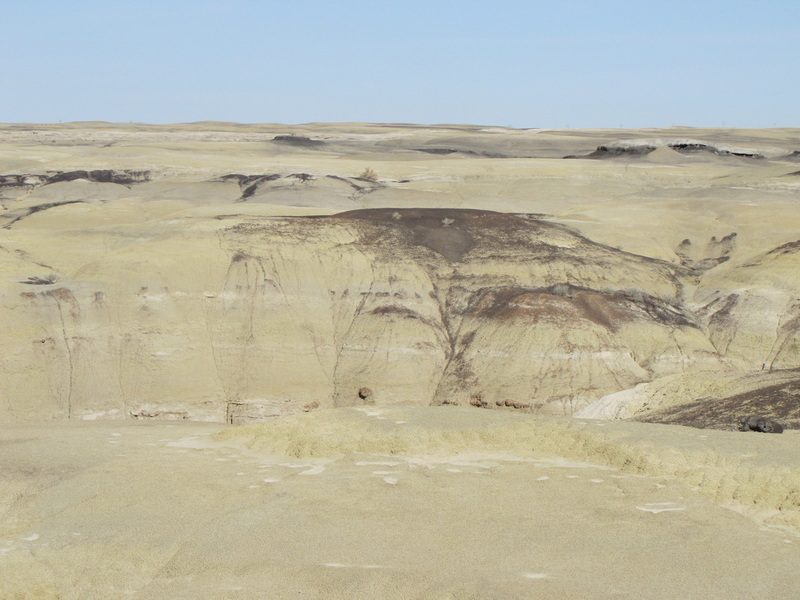 If you climb straight up from the point marked in the title of this section, turning northwest from the flats, you will need to scramble up to the very top of the ridge to avoid being cut off by erosion gullies. Heading west on the top, you will eventually reach grass again (visible to the west, as in the center background of the picture below, left). 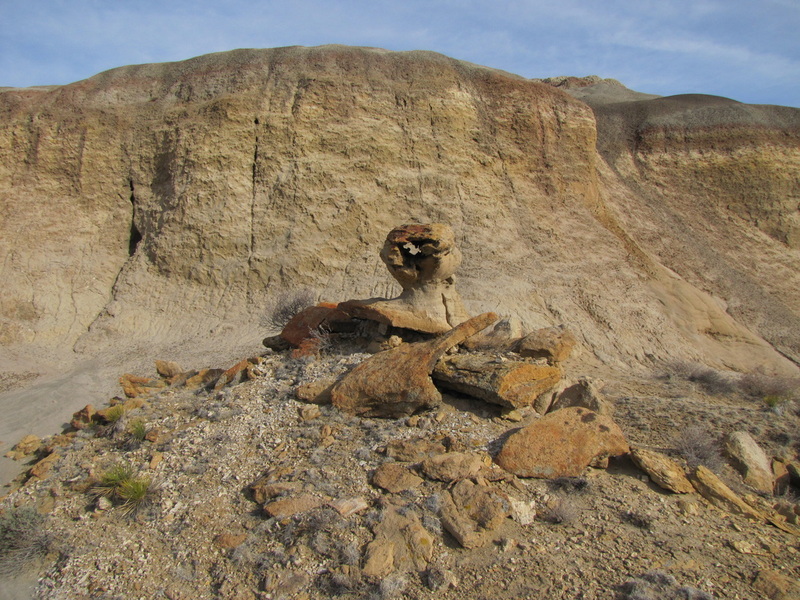 There is some nice agatized petrified wood (below, right) and many mysterious fossil chunks, as a reward for the somewhat tricky footing. I am in no great shape, and walked up as described with a 35-pound pack. This is not a dangerous or demanding scramble. If a mountain climber rated the slope, it would barely count as a "2" on the 1-to-5 scale that people who climb Fourteeners use. The northern and animal track routes would be at "1." As soon as you are standing on grass, regardless of your route, you will be able to see this abandoned shack. Head to its north side and you will eventually cross one of two tracks. The GPS coordinates above point to the place where the two tracks intersect. 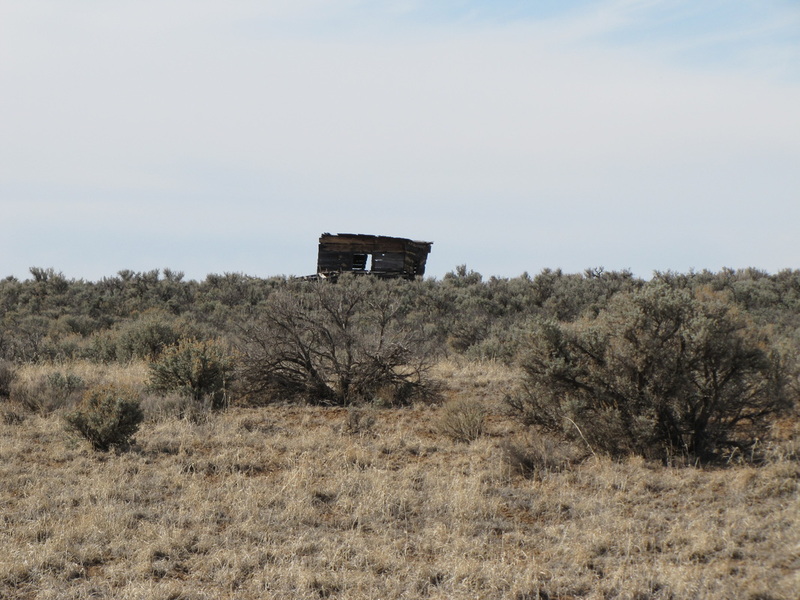 The abandoned hogan and house that I mentioned just above lie within 100 feet north of this point, just off the northern edge of the mesa. It is an easy climb down or up to/from the hogan. Once you find the track that runs to the west, follow it for a mile or two until it winds down into the washes and turns northerly. This walk along the center line of the mesa is the most interesting leg of the first day's walk. Walking along the mesa top you can see the different colors of several washes. To the north are Hunter Wash and Willow Wash. Alamo Wash starts just south of the western edge, and so is out of sight on this leg of the walk. 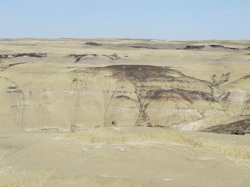 De-Na-Zin Wash is visible to south. Detour as you like. 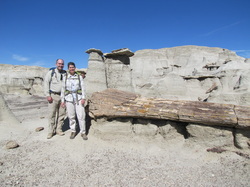 The large petrified log (pictured, left) is near the end of this mesa-top leg of the hike, and lies just south of the trail. You can see De-Na-Zin Wash in the background of the picture. After this log, the path begins to descend. 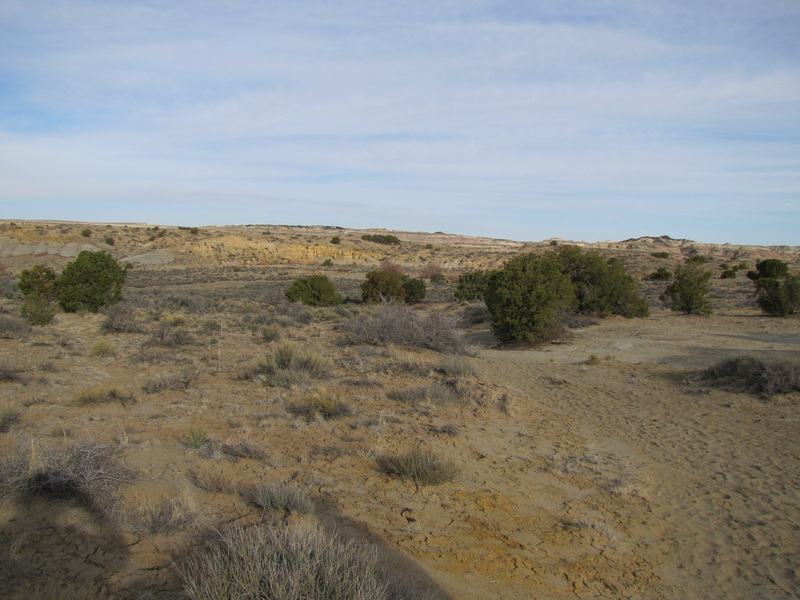 The grass and sage fades away as you come down the western slope of this little mesa, and eventually approach some barren flats. As you reach the bottom of the flats, the path passes an abandoned stone house (left - cow optional). Turn due west from the house and walk to Alamo Wash. You now start a long and monotonous walk of four to five hours. I walked this route with two hiking partners in late March 2013. I told them that we would follow the wash until we were sick of it, then follow it for another two or three miles. The next morning, they told me I had estimated that about right. This leg of the walk looks like the pictures to right and below, repeated in slight variations again and again. Animal tracks provide cut-offs that allow you to spare yourself some of the endless loops of the wash. Still, it is long and monotonous. If you were not following a ribbon of wash you would be sure you were walking in circles. I can only say that, tomorrow, it will be worth it. The wash is not difficult to find or follow. You can safely cut off loops by following many animal tracks - it seems like a lot of cows and deer have run this wash over the years, and they figured out some great shortcuts. In the last mile or two of the long walk down Alamo Wash, the wash broadens, straightens and turns somewhat more southerly. There are two low fences to climb - don't worry, you are still in the Wilderness. They are derelicts from old grazing leases. The second fence does not go over the black butte that will show up on on your right at first. The wash will then pull you to its right (west) side as you approach, and you can see that the wire has been cut just west of the wash (not by me). After you step over the cut wire, look right (west). 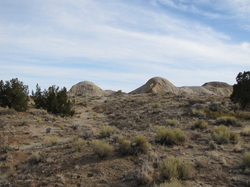 There is a small, shallow box canyon with an entry (pictured, left) at the above coordinates. It provides some shelter from the wind, especially on the south wall. Last trip my tent was at N 36˚ 15.987'; W 108˚ 10.471'. 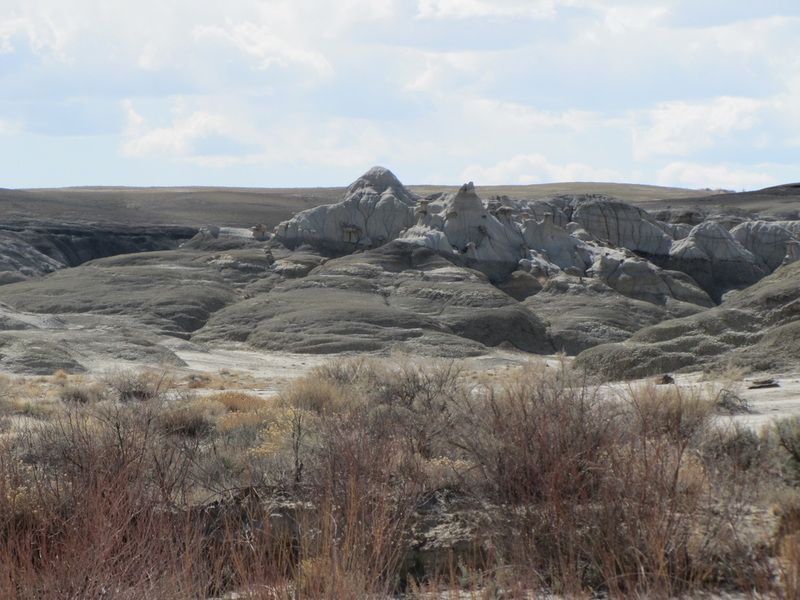 There are about five miles and three hours more before the Bisti parking lot, and the next two miles are a little tiring. It's more fun to start fresh, but you can do the hike in one twelve-hour day. 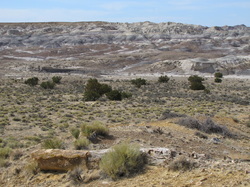 Climb from the southwest corner of the little box canyon up to the grassy mesa visible on the west side (and in the picture at left). There are several good ways up, clearly visible. 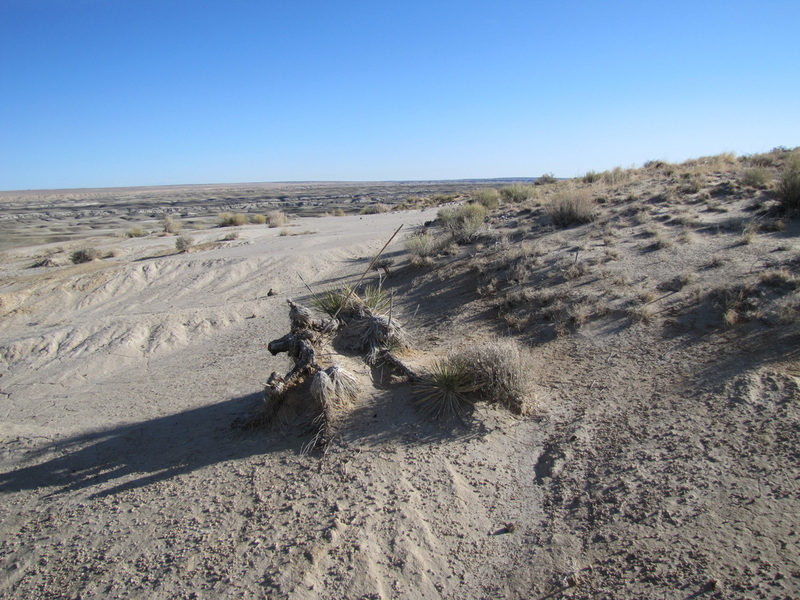 A jeep trail follows the southern edge of that mesa, starting at the coordinates above. 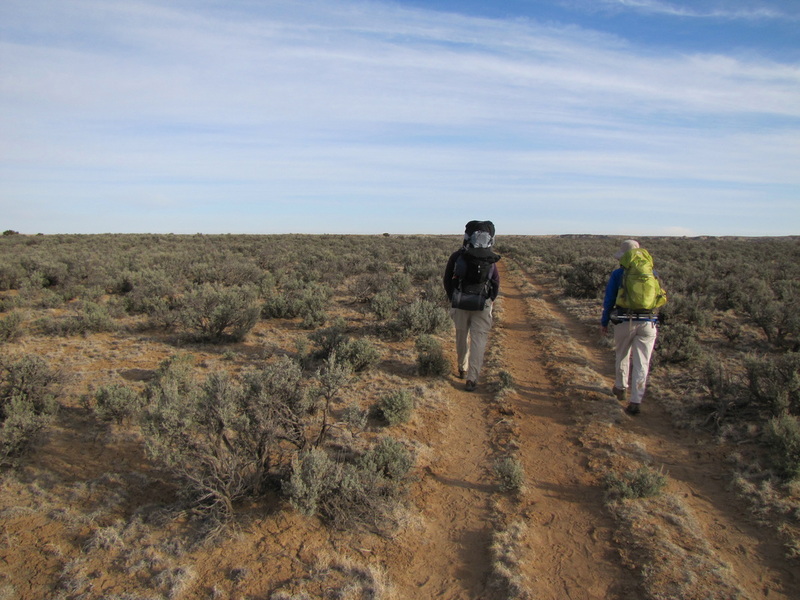 Follow the jeep trail westerly through a sparse meadow of grass, sage and occasional prickly pear, until there is a broad turning in the path, just north of a set of stakes or fence posts. at N 36˚ 15.697'; W 108˚ 10.958'. Turn uphill (northwesterly) against the grain of three or four ripples in the sand that would like to become dunes. 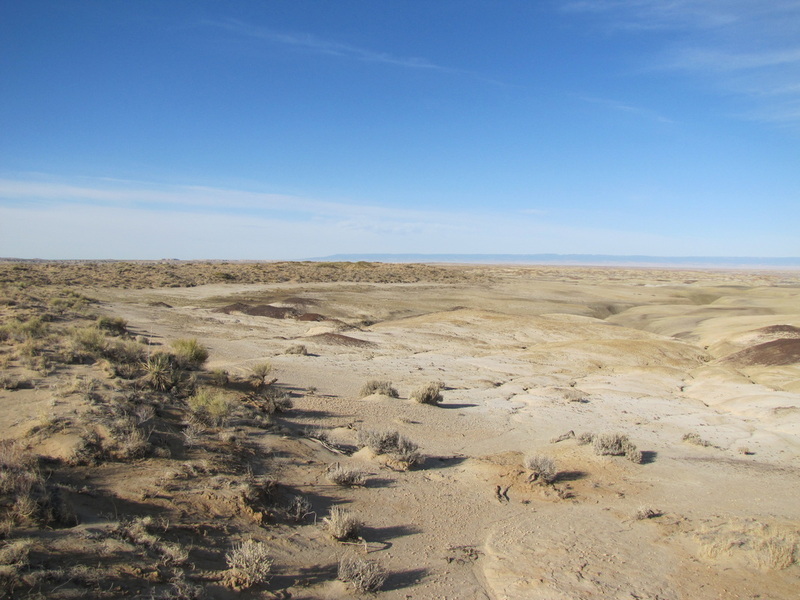 At the top of the first ripple, look north and you will see several hummocks of brush that are holding the sand together, outlined on the horizon. Aim for the largest hummock and you will arrive the right place after about 15 minutes. Usually, when I walk over the dunes/meadow, I come to the end of the sand and grass at the middle of the crescent of hard sand (pictured, left), which lets down onto ash that extends for several miles north and a mile or two west. Below left is a picture of the view west. This next mile will be the most interesting and extraterrestrial of the hike. I hope and expect it will make up to you for the boredom of the long walk down the wash yesterday. 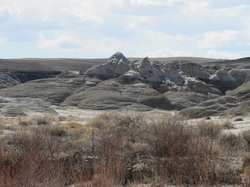 If you look closely at the photo below left, taken west from the stump that is shown below right, you will see a unique formation on the valley floor - a block or wall of gray topped with a brown band. It is casting one of the two most distinct shadow, just right of the center of the photo. I call it the "siltstone cap" and it is a very valuable landmark for this leg of the walk. Look at my other picture of it, more prominent, in the section below, titled "Moonwalk, part 3 of 3." Seeing it and knowing where you are in relation to it will be reassuring. 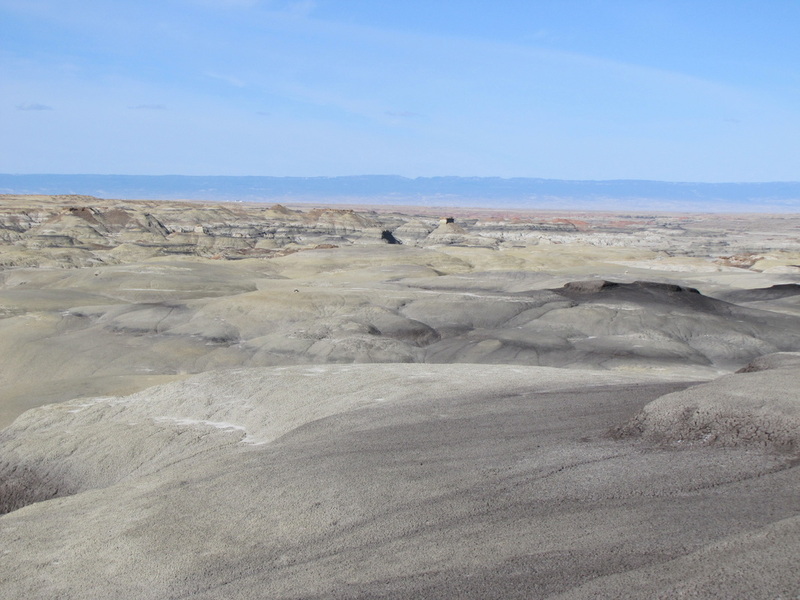 There are several crescents along the long line between sand and ash on this moonscape. To be sure you have found the right crescent, look to the eastern end for a small stump holding a mini- hummock of sand in place (maybe knee-high, but it stands out on the edge of the ash). The hummock is pictured below, right. The stick you see is a tomato stake I carried in, and it seems unlikely it will still be there after summer 2013. The coordinates for the stump are directly above, in the title of this section. The ash is cut through in many places with steep erosion gullies. They are hard to climb out of, and the soil at the bottom can be unstable, riddled with sinkholes and arroyos within arroyos. I have placed a series of cairns on the high points of a route of about a mile that avoids all the gullies - the only way through from the stump to the wash I have in mind. Rather than break this short leg into too many sections, I list the cairns with their coordinates, and two representative photos. If you do this leg of the hike in morning, the stones of the cairns will reflect the sunlight back to you. They are less visible in evening. Also, the ashy clay holds heat like a bed of embers and can be very unpleasant in afternoon, even on a cool day. From the stump pictured above right, look westerly. There will be a visible line of dark brown caps atop the ash pile, culminating in a brown-topped ash pile with a white cairn. Walk along the ridge tops and walk to it at N 36˚ 16.039'; W 108˚ 11.453'. You will pass lots of petrified wood fragments. If you go up and stand next to the cairn and look southwest, you will see fossil remains eroding from the ash. From the top of the ashpile, now look generally north, or maybe northwest. You will see a pale gray crescent of ash that stands out, with a black cairn in the middle of the crescent. Walk to the left of the cairn (it is placed more for visibility than to point the exact trai), to N 36˚ 16.121'; W 108˚ 11.535'. Standing on the white crescent and looking in the direction you are walking, you will see that the soil divides into hummocks just north of the crescent of pale ash. 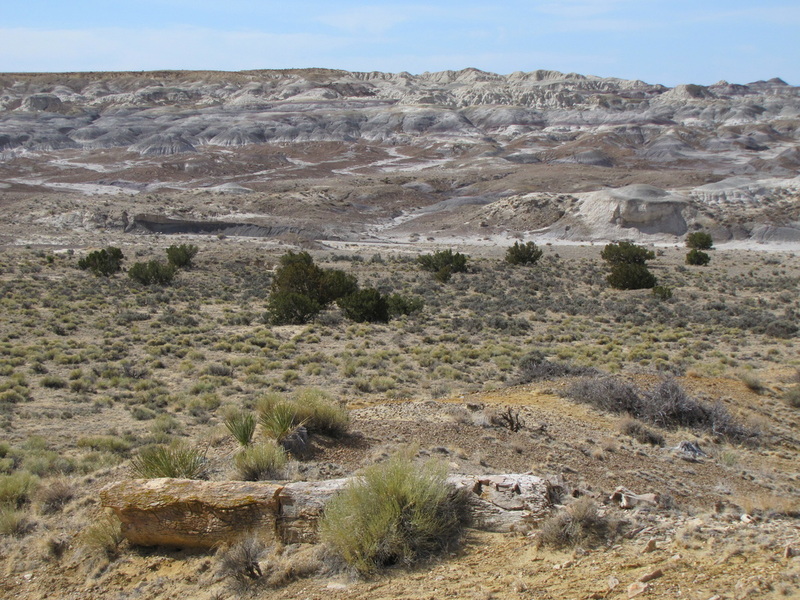 The one on your right, which has at least two scatterings of white petrified wood visible on it, is a dead end. 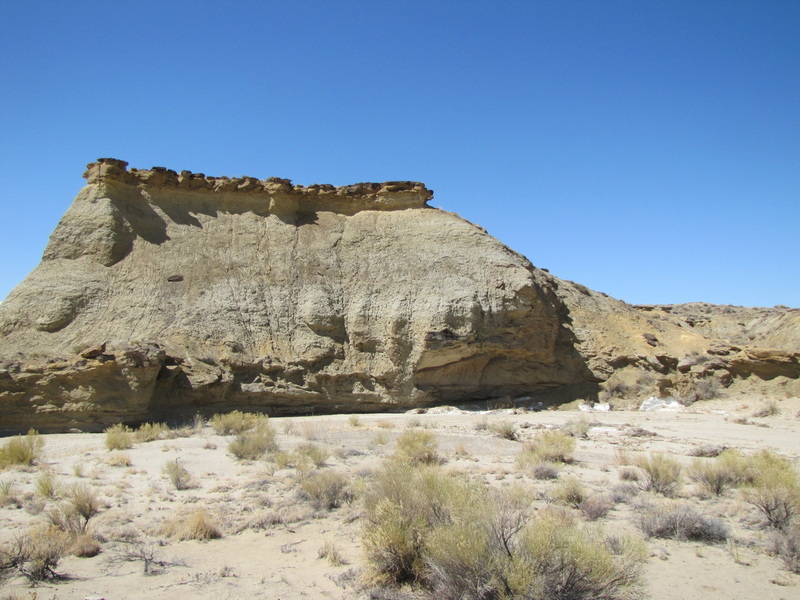 Go to the mound just to its left and proceed to another cairn, at N 36˚ 16.189'; W 108˚ 11.584'. Now, head due west, generally toward the distant siltstone cap, to (yet another) black cairn at N 36˚ 16.188'; W 108˚ 11.687'. Moonwalk, part 2 of 3. Turn a bit right and north, look for a white cairn (pictured, left), at N 36 ˚16.214'; W 108˚ 11.753'. Turn a bit more, so you are looking almost 90 degrees right from the siltstone cap (that is, turn so the cap is on your left shoulder) and look for the next white cairn, at N 36˚ 16.268'; W 108˚ 11.829'. Then, go to a brown cairn at N 36˚ 16.314'; W 108˚ 11.913'. So many markers in a mile may seem a bit looney, but the detail will help. There is a deep gully to either side of you, and the path forward is hard to see from above (but easy to see when coming the other way, up). I left my GPS at home once and relied on memory. After wandering around this point for more than an hour finding one dead end after another, I finally jumped into a likely gully and followed it to the wash. It was a long slide down, and I tore my pants. The subsequent few hundred yards were unpleasant because of several sinkholes and an odd gully within the gully that was a foot wide and six feet deep, forcing me to straddle it as I walked. After that experience, I started setting my cairns. You can now walk from one cairn to another without needing GPS. At the last cairn listed above, turn left - west - and more or less face the siltstone cap (prominently featured in photo to left). Proceed to a gray cairn at N 36˚ 16.289'; W 108˚ 12.000'. Continue west to a whitish cairn at N 36˚ 16.293'; W 108˚ 12.024'. Turn north again and look for my last cairn on the top of the ash heaps, a mixture of stone and wood, at N 36˚ 16.334'; W 108˚ 12.096'. By now you should see pretty clearly a deep cut to your north (the direction you are walking, so, right in front of you), running left-to-right. On the left side, that is, northwest of you, there is a "painted section" of wall. A clear photo is just below, left. Head straight for the colorful marks on the wash's north face and find your way down. The coordinates above are for a cairn on a mound on the wash bottom, below the section visible in the picture on left. The GPS fix may help you head directly to the easiest descent from the last cairn on the ash heaps to bottom. Stay on the right side of the last gully into the wash bottom. You can slide if footing is tricky. Mind the sinkholes. Once you get to the bottom of the wash, turn left and walk west. It is about 1/2 mile or so out of the wash. If you have the energy, take a detour in the wrong direction and go east up the wash a few hundred yards. The only colors will be gray ash and blue sky. It always impresses me. 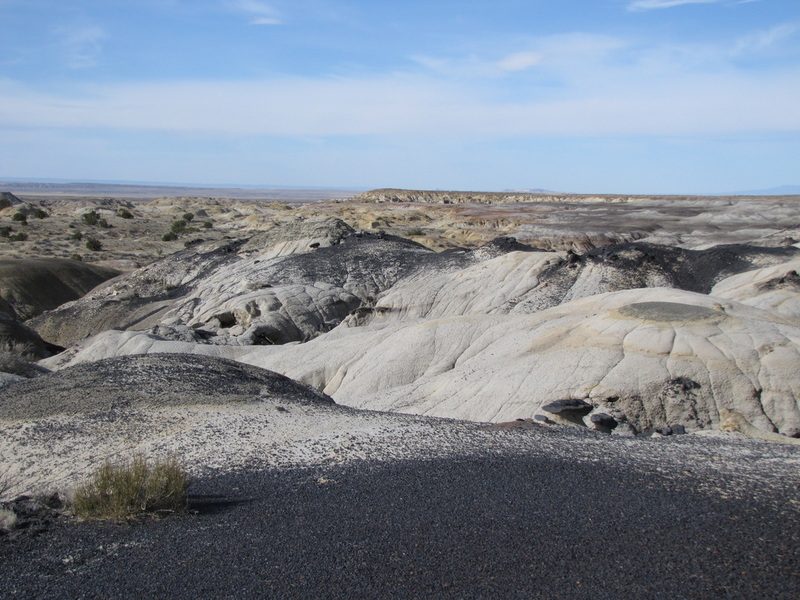 For those walking in to the ash heaps from the Bisti parking lot, the mouth of this wash is at N 36˚ 16.214'; W 108˚ 12.636', just northeast of the ferruginous hawks' nest. 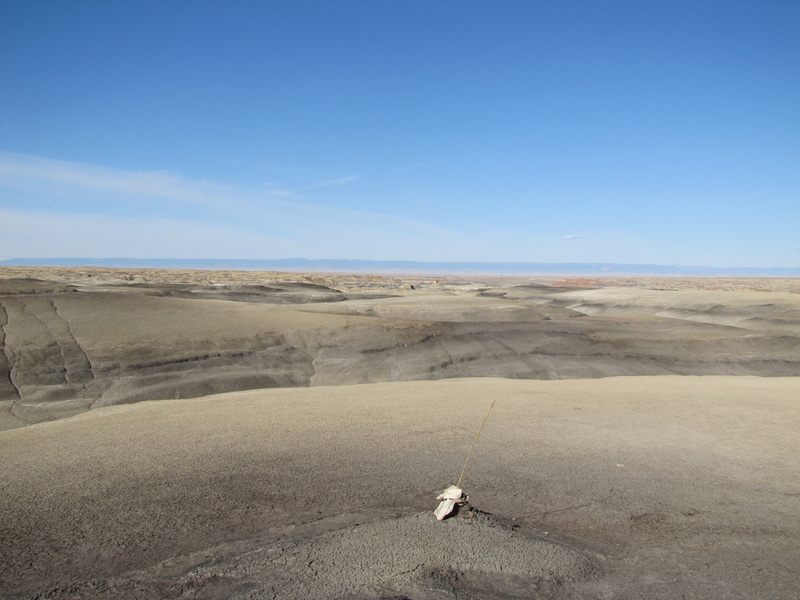 The cairn system works in both directions, and the cairn atop the mound in the wash bottom will tell you where to climb up. The mound is just before the wash splits in two. The parking lot is somewhat less than two hours' leisurely walk west of the mouth of the wash - less than 3 miles. 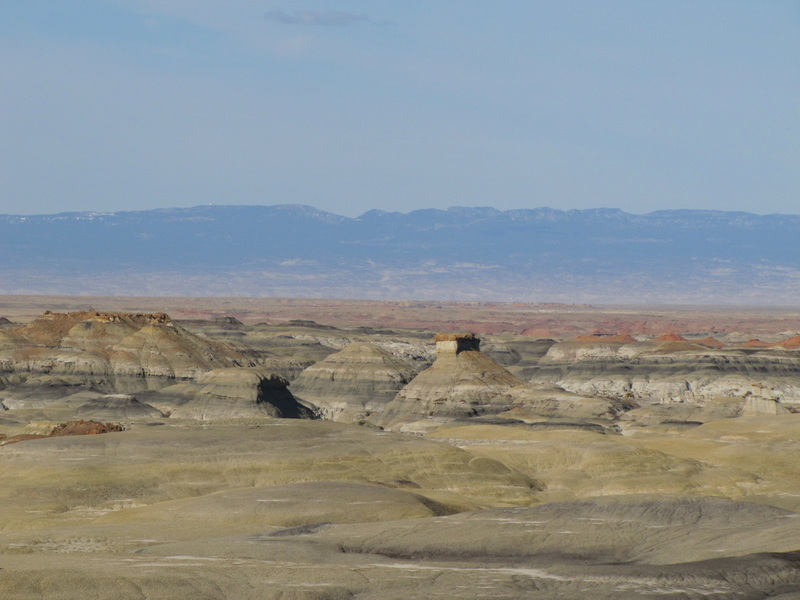 Follow the south wall of the shallow canyon that makes up Bisti, and see the ferruginous hawks' nest just northeast of the big siltstone cap, at N 36˚ 16.120'; W 108˚ 12.773'. 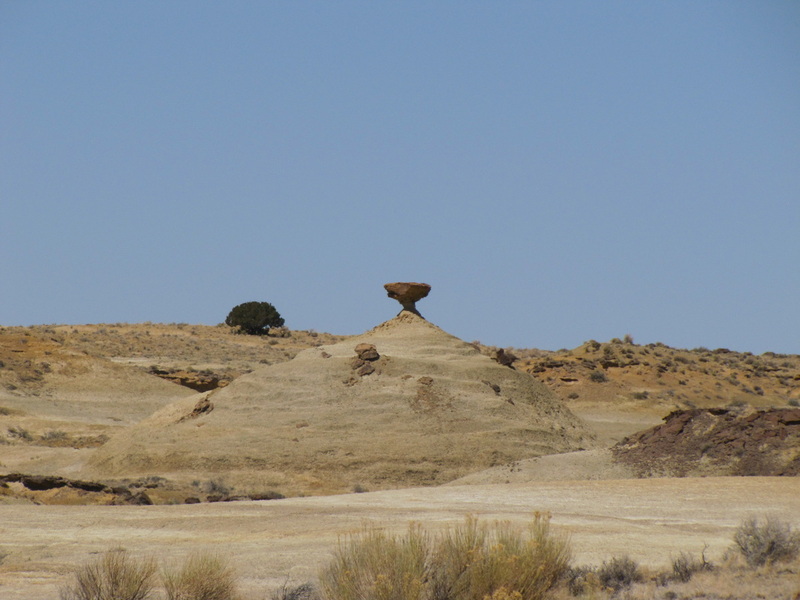 Go southwest of the hawks' nest and look at the little canyon behind and under the big siltstone cap. The little round stones there are glacial deposits from the last ice age, carried down from near Silverton. 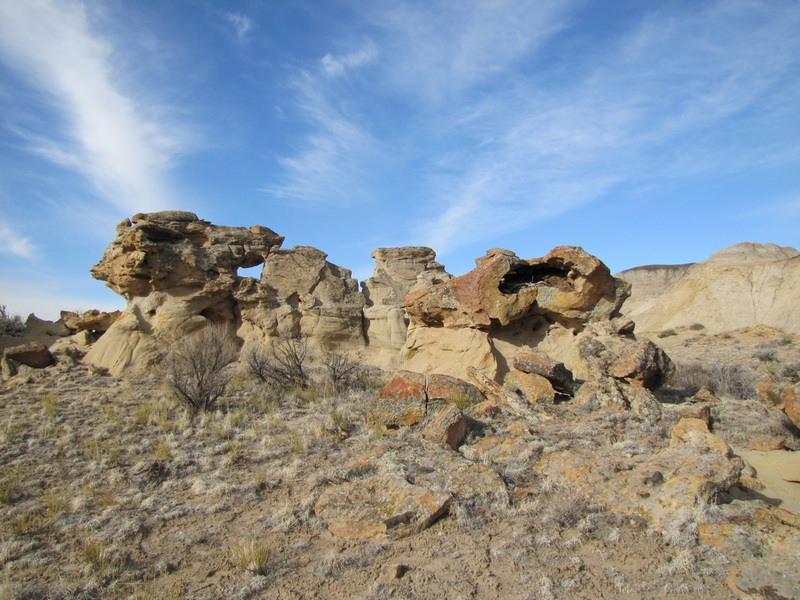 The alcove that holds the most petrified wood can easily be entered at N 36˚ 16.024'; W 108˚ 13.125'. The big cypress trunk shown to left is at N 36˚ 16.081'; W 108˚ 13.200'. Coordinates for more noteworthy sights in Bisti that you can see on your way toward the parking area, such as the Nursery/Cracked Eggs, are listed in Bisti Hike #1. 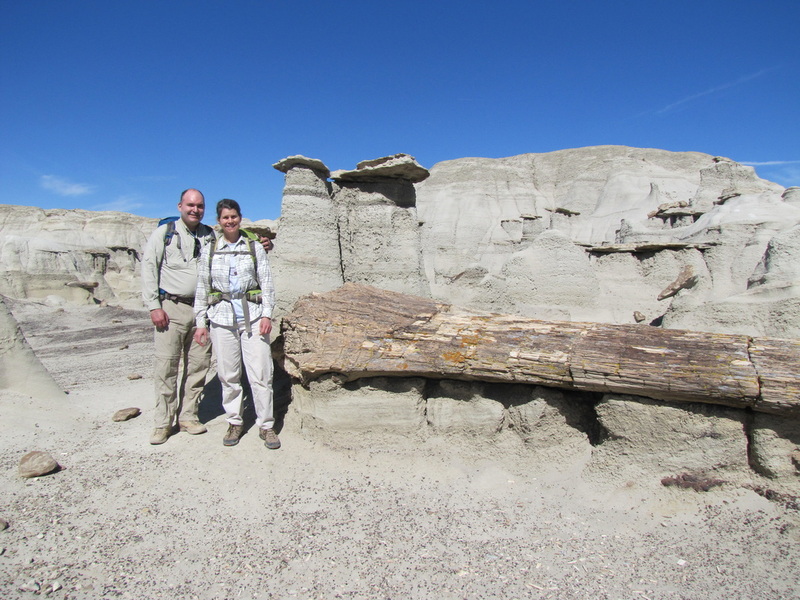 (Click "Bisti Trailhead" at the very top of this page, follow the link.) 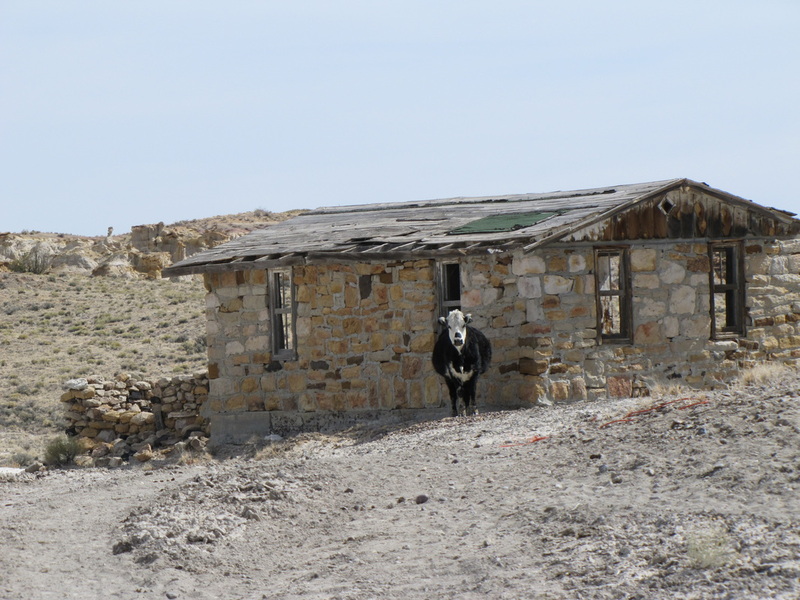 I hope you remembered to carry the key for the car you parked in Bisti!